Using a fork, pierce potatoes once on each side, about 1/2″ deep. Rub the outside of each potato with olive or canola oil, about 1/2 teaspoon per potato. Sprinkle a little kosher or sea salt on potato skins. Place potatoes on a cookie sheet and bake until tender, approximately 1 hour. Cut each potato in half lengthwise. Scoop out the potato and place in a medium mixing bowl. Leave a thin layer of potato behind to prevent skins from tearing. Add 1/4 teaspoon paprika, black pepper, salt to taste, yogurt, milk, 1/2 cup cheese and green onion to potato. Use an electric mixer or potato masher to combine ingredients. 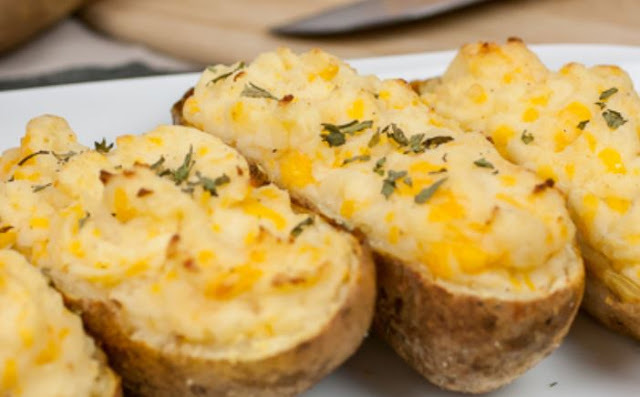 Evenly divide potato mixture into shells, sprinkle with remaining cheddar cheese and paprika. Return potatoes to the oven and bake 15 minutes.